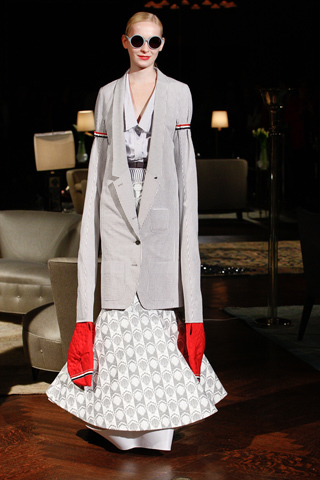 One thing is certain – Thom Browne never bores his audience. His shows are consistently off-beat and in my opinion – highly entertaining. I find his Spring 2012 collection particularly interesting because wearing an entire look of his, from head to toe, could be borderline Gaga – but if properly edited, each of the looks shown below has an element that I would love to add to my wardrobe. Then, I would create an occasion to wear it! I love the white mermaid skirt. 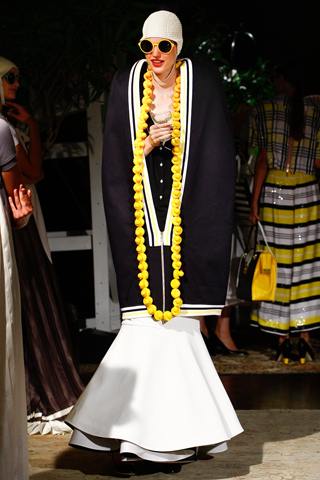 I would pair it with a simple black tank and wrap the yellow beads around my neck a few more times to shorten them. 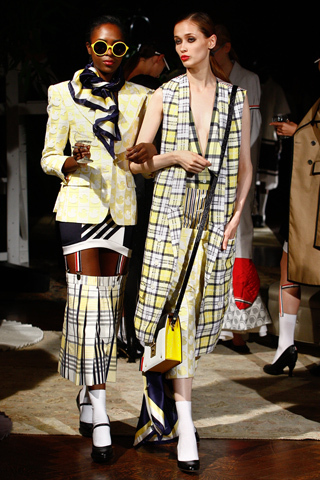 Love the herring bone skirt. I would ditch the oversize coat and instead, pair it with a strapless, clean lined bustier, wide black paten leather belt, and classic Louboutin peep toes. I would definitely keep the shades! Love the sailboats. Perfect for the 4th of July – sans no-neck jacket. I think it would be darling with a basic white cotton razor back tank. 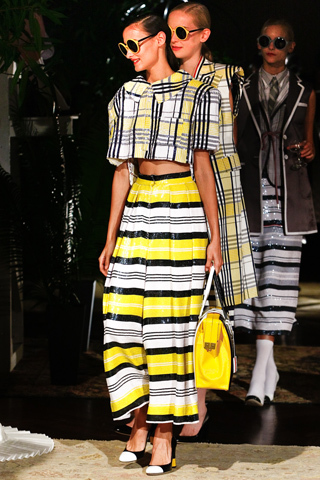 Honestly, I am kind of liking this entire look - but I think it becomes more wearable as separates. 1. Plaid top paired with black cigarette pants. 2. Striped pants with a navy and white polka dot vintage cut bikini top for a stroll down the beach...oh and a big straw hat! I’m definitely no fashionista, but I’m loving your capsule summaries of the shows, and I particularly like your revisions to this collection. The claws are hilarious, but I like the skirt that goes with the ensemble – maybe with a gray tank similar to your suggestion with the first look? The “Claw look” makes me think of the old halloween costume where you put a pillowcase over your head and shoulders to look like a big face, this is reverse look of that. Guess it would be perfect for a lobster or crab boil!! !